If you have the space, then why not go for it? 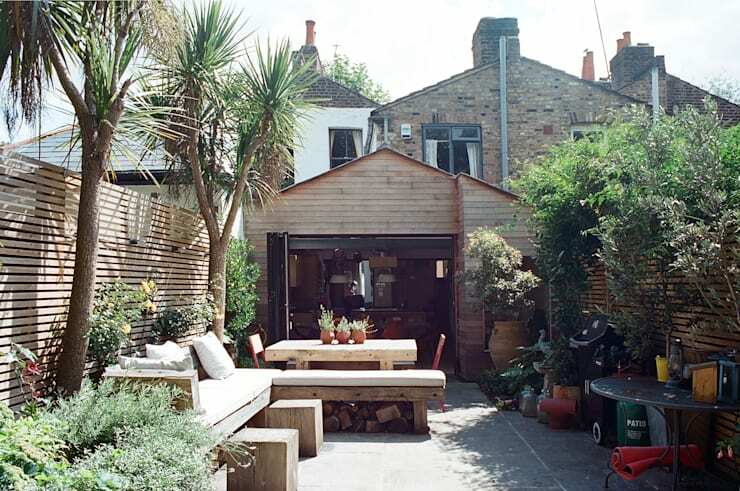 That was the mindset of these London-based homeowners who decided to get rid of their gloomy little back yard in exchange for something a little more upbeat and stylish. Architectural experts Tom Kaneko Design & Architecture were brought in to helm this renovation. Shall we see how they fared? Before we get to see the artistic magic that our designers accomplished, we need to see the canvas that they were presented with, which was a standard backyard of concrete slabs and tiny section of ground. Ultra drab and extremely dull-looking, it is no wonder that the homeowners decided to opt for something with a little more pizzazz. And what a fantastic transformation! Not only did the garden receive one decent makeover, but an entire new volume was added to the house. 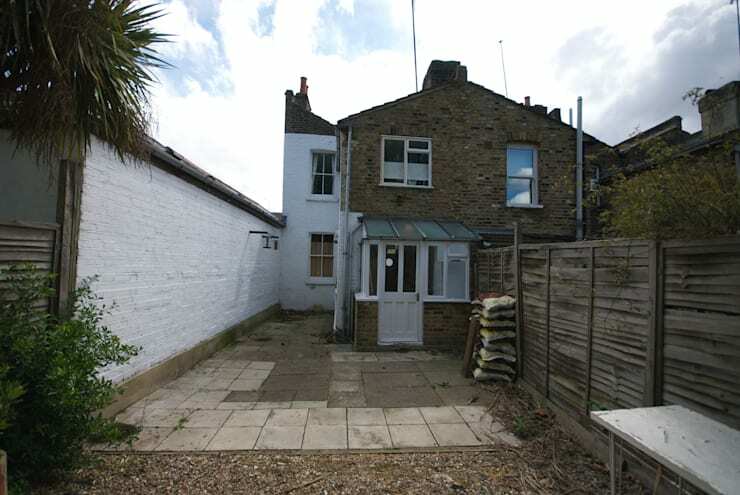 Opting to make the house bigger, a few metres of additional residence was added. The facade was adorned with a lightly toned timber panelling, mimicking the new garden fence. And since the new addition still didn’t cover up the entire backyard, it was decided that a stylish and sophisticated garden space may just as well happen! And just what, exactly, was added to the house? 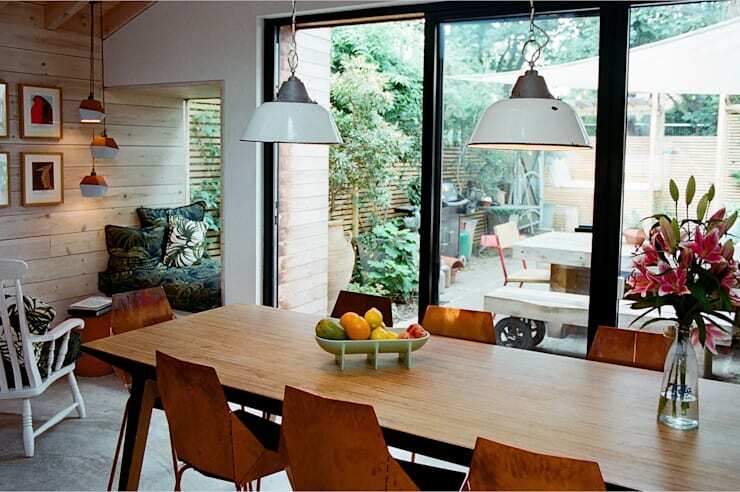 A little kitchen and dining room area, sharing an open-plan layout, as can be seen here. Light neutrals of concrete, brick, and wood stepped in for the building materials, and a sublime skylight was also added to ensure a decadent dose of natural lighting. Here we get a closer look at the newly added dining room area, which flaunts a handful of different styles. 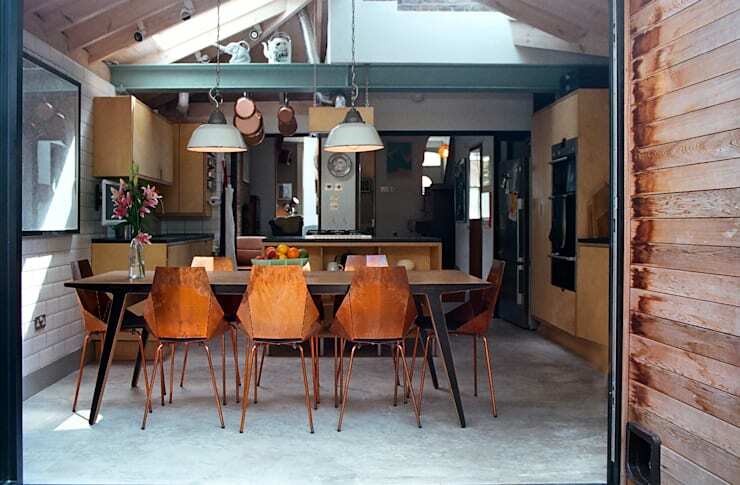 Copper chairs add a touch of industrial to the area, while that slim and simple dining table, as well as the wooden-panelled walls, brings some modern Scandinavian into the mix. When it comes to the lighting, the fixtures hanging over the dining area are more rustic and shabby chic, while the ones dangling above the newly added seating corner (on the left) are decidedly of the modern era. With a mix and match of different textures, patterns, colours, and styles, this space is most charming and welcoming, creating a very authentic and lived-in feel for this British family. Norwegian spruce wood was used for the interior walls, not only for its pale, tranquil look, but also for its cost-effectiveness, as this renovation relied on a rather tight budget. A snug little seating corner was added to the window, with plush pillows conjuring up a comfy spot to enjoy some sun and do some reading. 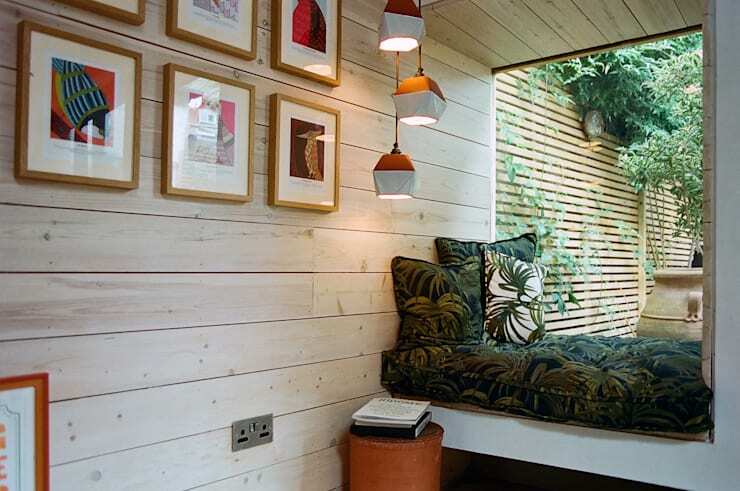 Natural, earthy colours reinforce the strong link between the interior- and exterior spaces, with both sides sporting wooden panelling and thick green leaves, even if the insides’ foliage are only patterned fabrics. A skylight was added in-between the old and new parts of the house, injecting a delicate dose of sunshine into the interior spaces. 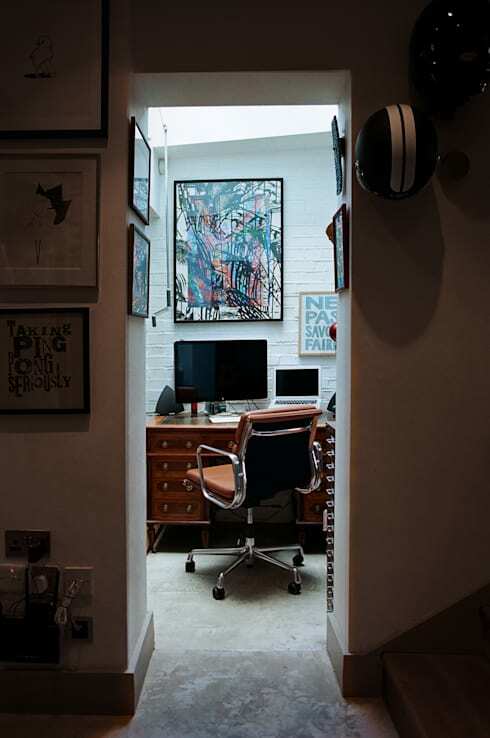 Although neutral colours reign supreme in the home office shown here, a vivid touch of brightness can be detected in those wall arts adorning the white brick wall. And just to satisfy our curiosity of how exactly this house’s layout comes together, here we can see a blueprint of the ground floor seen from above, with the newly made-over garden on the left. Since it’s a tad difficult to view this house from the side (seeing as it’s wedged in quite tightly between the adjoining neighbours’ homes), a blueprint will have to do. Here we can see that the newly added volume that leads out into the garden is the same height as the original house’s ground floor, forming a consistent and harmonious link between both buildings. Want to see some more stylish transformations? Then treat yourself to: The remarkable metamorphosis of an old-fashioned house. A fantastic change? Or not your cup of tea at all? We’re curious, so tell us what you think in our comments space, below.